Her memory sparked as the various sounds enveloped her mind, the crashing of the waterfall, the splatter of raindrops through the treetop canopy. Her own tears dripping one by one upon her dress. Although she could picture each of them in vivid array she could no longer hear the individual sound of each. Inside they were but a muted rushing roaring through her slowly dulling senses. Turning her face upward, she felt the raindrops mingle and entwine with her own salt filled teardrops; slowly cleansing the pain within. 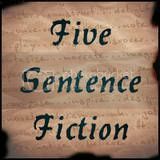 Linking up with Lillie McFerrins' Five Sentence Fiction. Very sad and moving. You put us right there with her. I suppose the dress is ruined, too. Great sensory details in this one, especially sound, with the splashing and muted rushing. We don't know what's causing the pain, but the sense of relief is still really strong. Nice work! So often our souls blend in harmony with nature, raindrops, teardrops, and a waterfall of sadness washing pain away. Beautifully descriptive! Beautifully moving piece of writing. The image of the mingling of her own tears & the rain cleansing her was very powerful. Love this Car - beautifully written. I know this sensation too well. very well written.